So, I've decided to start a blog. Why, I'm not sure. Maybe to counter my urge to photograph everything I make, maybe to legitimise it. Either way, welcome and I hope you enjoy your stay. I'm going to start my blog with strawberry jam, which I hope it a good place to start. I made jam for the first time, it was a fun experience. The winter strawberries are plentiful at the moment and incredibly cheap and, though I've never been a fan of strawberry jam, I am definitely a fan of strawberries. So, I thought to myself "maybe home made strawberry jam tastes better than the stuff from the shop" and sett about finding out. Sure enough - it does! 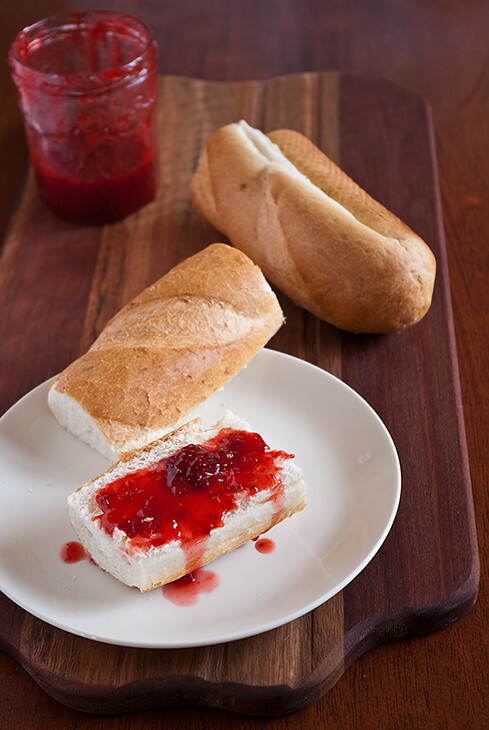 I'm not about halfway through a stick of French bread covered in strawberry jam and I'm feeling pretty content. Home made strawberry jam, it turns out, tastes like strawberries! It also turns out Jam is very, very easy to make. Admittedly I didn't make a large amount as I have no need for more than 2 jars of jam so maybe it's more effort to make it in large batches. The two jars of Jam I made took 500g of strawberries and less than an hour - this includes finding jars, drinking tea, sterilising the jars, drinking more tea, hulling the strawberries and everything else. I completed my jam this morning before getting dressed and having breakfast, I felt quite accomplished by the time I was done. I bet you can guess what I had for breakfast. Wash, hull, and halve strawberries. Place sugar, strawberries, and lemon juice in large wide-based sauce pan, such as a stock pot. Dissolve the sugar over a medium heat, and then bring to the boil. Reduce heat and simmer for 20-25 minutes or until the temperature reaches 104°C on a candy thermometer. Be sure to skim off the foam with a metal spoon while the jam is simmering. At around 15-20 minutes place a small spoonful of jam on the cold saucer and run your finger through it. A line should remain, if it doesn't cook jam for a further 5 minutes and test again. Once cooked carefully pour jam into hot, sterilised jars. Store in the refrigerator.